Dagwood Bumstead is a main character in cartoonist Chic Young's long-running comic strip Blondie. He first appeared some time before 17 February 1933. He was originally heir to the Bumstead Locomotive fortune but was disowned when he married a flapper (originally known as Blondie Boopadoop) whom his family saw as below his class. He has since worked hard at J. C. Dithers & Company (currently as the construction company's office manager) to support his family. The Bumsteads' first baby, Alexander, was originally named Baby Dumpling. The name of his younger sister, Cookie, was chosen by readers in a national contest. The family circle is rounded out by Daisy the dog. The origin of both Dagwood's last name and Daisy's name came from Chic Young's long-time friend Arthur Bumstead and his dog, Daisy. His favorite things in life include his wife Blondie, his kids, naps on the sofa, long baths, and food. Dagwood was famous for concocting tall, multi-layered sandwiches topped with an olive on a toothpick, and the term "Dagwood sandwich" has entered American English. He frequently has problems with door-to-door salesmen, rude telemarketers and store salespeople, crashing into the mailman (Mr. Beasley) as he rushes from home, getting ready before the carpool leaves without him, getting to work on time, his boss J.C. Dithers, and Cookie's many dates. He is often suspicious of her dates and keeps a close watch on them when they come to the house. Other characters in his universe include Elmo Tuttle, a pesky little neighborhood kid who wanders in and out of the Bumstead house, next-door neighbors Herb and Tootsie Woodley, Lou, the sarcastic cook in a local diner, and Mr. Dithers' domineering wife, Cora. Dagwood's birthday is July 20. 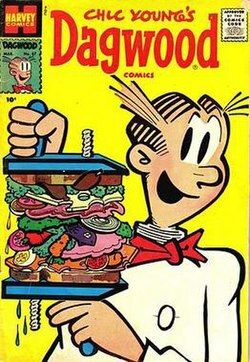 Over the years, Dagwood has appeared not only in daily newspapers, but in comic books, Big Little Books, Whitman novels for children, and other print materials, as well as radio, film, and television. Arthur Lake played Dagwood in the Blondie film series (1938–50) and the short-lived 1957 TV series Blondie, while Will Hutchins played him in a revival series (1968–69). He makes several cameo appearances in Garfield Gets Real, alongside Grimmy from Mother Goose and Grimm. Dagwood and his wife also made a cameo appearance in a Garfield strip originally published April 1, 1997. On a fourth wall break, Garfield refers to this as "moving to a different comic strip". Dagwood made another appearance in Garfield comic strips in August 20, 2005 to invite Jon and Garfield for his and Blondie's anniversary party. In the song "Homemade Mummy" alternative rapper Aesop Rock briefly refers to Dagwood. This page was last edited on 14 April 2019, at 17:04 (UTC).